was a very successful one. All my six candidates passed with flying colours! Hats off to them! It was three days of hard work and nerve control for all of them but in the end it was all worth it after the PADI Examiner, Thomas Knedlik, congratulated them. A collective sigh of relief was heard all along the beach. Here's Thomas during his briefing to all the participants of the IE. This is the moment they've all been waiting for and worked so hard for during the last two weeks, the group photo of the IE! 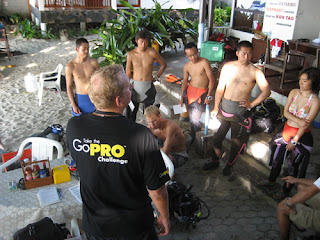 Standing from left to right; Nobuhiko Abe, my Japanese Staff Instructor who did a great job with the Japanese candidates, Thomas Knedlik, the PADI examiner, myself, Sean McNamee and Naoki Igarashi. Sitting from left to right; Toshihiro Minowa, Atsushi Sasaki, Maki Nakagawa and Matsubara Yoshimichi. Good luck to all of them in their respective PADI Instructor careers. 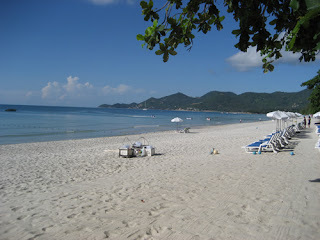 Here's a shot of Chaweng Beach at 8 am, showing off it's pristine beauty. Tonight the party is on!